Tomorrow is the big day for Mattie’s Tasting! If you are near Hickory, NC please stop on by and say HI! I would love it! I will definitely have to post pictures to share it all with you! I was recently on the phone with my Grandma (I capitalize because she is a very Grand person!) and you know I am a huge fan of getting recipes from her, right?! 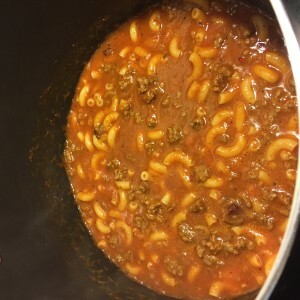 Well this goulash recipe I actually got from my mom who got it my grandma and so on and so forth. So, really I have no idea whose recipe this really is! 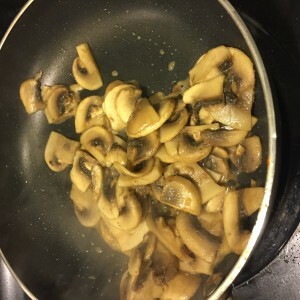 Don’t you just love recipes like that? 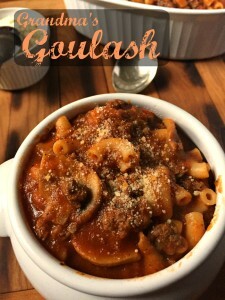 However, what is goulash really? What a definition. I have visited other people who have made goulash and honestly, when I was a kid I thought it was what my mom made when she was just too lazy to make a big meal… Yeah that is what I really thought. (you can scold me later mom!) I didn’t like it as much even though she pretty much made it just like her spaghetti just with elbow macaroni. However, people do really put thought into what they put into their goulash! I figured that out as I got older and everyone’s is different! 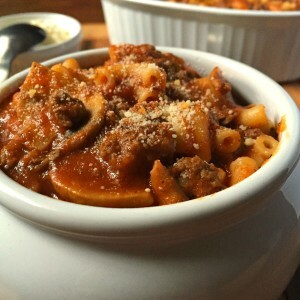 Nowadays, I love goulash and love making rather large quantities because, well, I am a lover of leftovers for lunches. I also come from a close family and whenever we get together there is always a bunch of people and this dish is always the perfect thing because it can make enough for 8-10 people easily. It is just a great meal to make after a busy night. When I was in college it was comfort food for me! Cook your Macaroni to aldente (not quite done done) and set aside. Don’t forget to follow me on Twitter (@Not2ShabbyGabby), Pinterest (@Not2ShabbyGabby), Instagram (@NotShabbyGabby) and Facebook to stay up to date on all recipes! I hope you have a great and blessed weekend!